As heir to the kingdom, his mother tells him he must use the occasion to choose a wife from amongst the guests. Unhappy that he can’t marry for love, Siegfried escapes to the forest with a group of friends and the crossbow his mother gave him as a birthday present. Pictured: The Imperial Russian Ballet perform Swan Lake at the international music festival in Sarajevo, 2006. He reaches a beautiful lake where he sees a bevy of swans flying over it. Eager to try his new crossbow, he gives chase. Pictured: The English National Ballet's upcoming production of Swan Lake at the Coliseum, 2011. As dusk falls, Siegfried takes aim at the swans with his crossbow, but before he can shoot, he is stunned as he watches the Swan Queen turn into a beautiful woman in front of his eyes. Pictured: Darcey Bussell and Zoltan Solymosi of the Royal Ballet perform the pas de deux from Art II, 1992. Siegfried is immediately enraptured and, as the pair dance, he learns her story: she is the princess Odette who, during daylight, is condemned to be a swan, along with the other girls, after being cursed by evil sorcerer von Rothbart, who is also Siegfried’s mentor. At night they become women again. The curse can only be broken by a man who pledges his heart solely to Odette. Pictured: Daria Klimentová and Vadim Muntagirov perform selected extracts from the English National Ballet's Swan Lake, 2011. Just as Siegfried is about to confess his love to Odette, the pair are interrupted by Rothbart who pulls the Swan Queen from Siegfried’s embrace and orders the swans to dance on the lake, away from the Prince’s reach. Pictured: The English National Ballet perform Swan Lake in the Round at the Royal Albert Hall London, 2010. Siegfried heads back to the castle in time to attend his formal birthday celebrations at the Royal Palace. He dances with each of the princesses who have been presented to him as prospective brides, but he can’t stop thinking about Odette. Pictured: The Royal Ballet dancing Swan Lake, 2011. Rothbart, in disguise, arrives at the ball to the sound of trumpets accompanied by his own daughter Odile who Rothbart has cast a spell on to make her look identical to Odette. The one difference is that she wears black, Odile white. Pictured: Russian ballet dancer Rudolf Nureyev and Natalia Makarova of the Kirov Ballet, 1970. Siegfried flees the castle and runs to the lake to find Odette. After a passionate apology, Odette forgives him, but as the pair dance, Rothbart appears and tears them apart. The lovers realise that they can’t break the spell because of Siegfried’s earlier pledge to marry Odile. Pictured: The Bolshoi rehearsing Swan Lake, 2008. Death is the lovers’ only means of escape from Rothbart. They jump into the lake and drown, destroying the evil sorcerer powers. Bereft of his magic, he dies too. Dancers of the Compagnie des Ballets de Monte-Carlo perform 'Lac' (Lake), a ballet choregraphed by Jean-Christophe Maillot', 2011. This is the most recognised storyline, but there have been, and continue to be, many variations. The original version, then called The Lake of The Swans and choreographed by Julius Reisinger, was premiered by the Bolshoi Ballet in 1877 and featured a happy ending when Siegfried, after a fight with the sorcerer, rips off Von Rothbart’s wing thereby destroying the spell he cast over the swan maidens and allowing him and Odette to marry. Pictured: Moscow's Classical Ballet Ekatarina Berezina and Ion Kuroshu, 2008. The ending was changed in 1895 for the revival at the Mariinsky Theatre in St. Petersburg. This version, now the one most ballet companies base their performances on, was choreographed by Marius Petipa and Lev Ivanov, while St. Petersburg Imperial Theatre's chief conductor and composer Riccardo Drigo revised Tchaikovsky's original score. Pictured: Swan Lake performed by the Mariinsky Opera and Ballet at the Royal Opera House, 2009. In a version danced by National Ballet of Canada in 2010, Odette forgives Siegfried for his betrayal but just as the lovers make-up, Rothbart summons forth a violent storm. Rothbart and Siegfried struggle and the sorcerer overcomes the prince, leaving Odette to mourn the dead Siegfried. Pictured: Rudolf Nureyev directing the Paris Opera Ballet in, 1988. Matthew Bourne’s ground breaking all-male Swan Lake was arguably the biggest shake-up to the ballet since the Mariinsky revival. Matthew Bourne's Swan Lake, Melbourne, 2007. The parts of Odile and Odette were originally danced by two separate dancers, but it has become customary for one ballerina to dance both parts to emphasise their similarities - and to highlight their differences. Pictured: Robert Helpmann and Margot Fonteyn, Sydney, 1943. It might be an integral part of the repertoire now, but Swan Lake was a critical failure when it was first performed by the Bolshoi Ballet in 1877. The audience lapped it up though and the Moscow Ballet continued to perform it under budget cuts forced them to stop pull this expensive production from their repertoire in the early 1880s. The ballet wasn’t performed again until 1895. Pictured: The Bolshoi Ballet at the Royal Opera House, 2006. The first full-scale version of Swan Lake on a British stage didn’t happen until 1934 when the Vic-Wells Ballet performed it with Alicia Markova as Odette/Odile. As of April 2011, the Royal Ballet have performed Swan Lake 946 times. 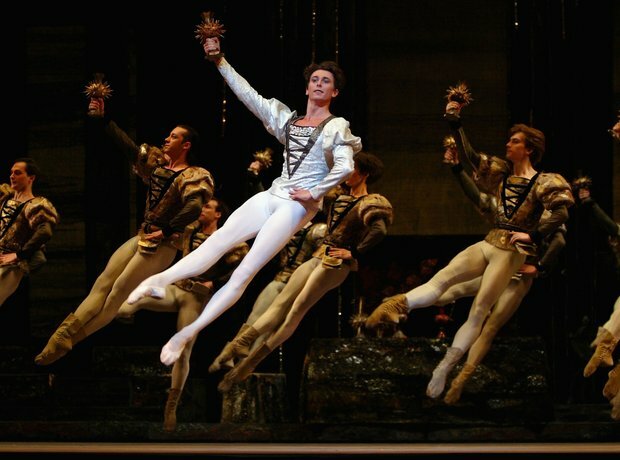 Frederick Ashton’s 1987 version has seen the most revivals by the company. Pictured: Margot Fonteyn as part of the Royal Ballet in 1955.